Victory is sweet, especially after a battle that has been hard-won, as any slot gamer can attest to when it is you against the reels. 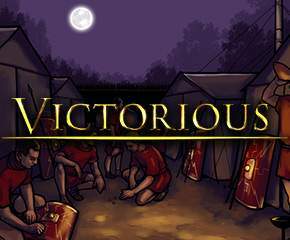 In the Victorious, you can bask in the glow of victory as you join an army in battle and lead them all into victory by winning lots of cash. Victorious has some excellent game features and graphics, which is the first thing that will tell you that this is a game by NetEnt. This casino game maker is based out of Scandinavia and has been churning out several great hits in the online casino world, and this is just one more great add to their collection. 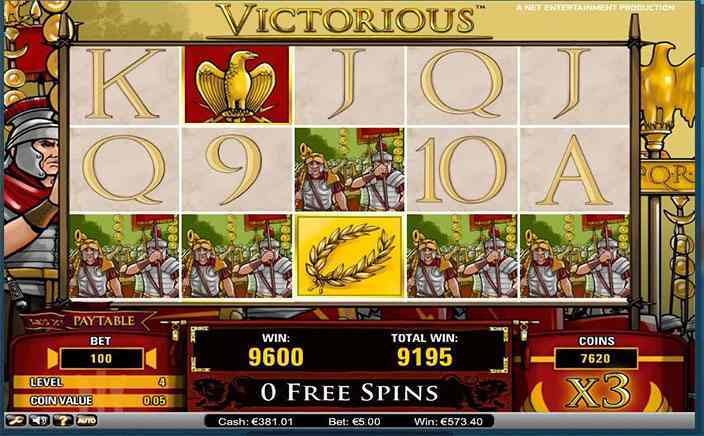 Victorious has 5 reels and 243 paylines, and the theme of the game is that of battle. You feel like you are in ancient Sparta as you fight on a bloody battlefield, looking for elusive victory with each spin of the reels. You can start playing by placing your wager and then hitting Spin, so that you can see if you are lucky with the symbols on the reels. Wild substitutions: The wild symbol in the game is the Golden Eagle sign that can be used to swap out other symbols on the reels so that you can make a winning payline. Look forward to some great wins if you get this symbol on the board. Free spins: The scatter symbol in the game is the Golden Wreath symbol. When you see 3 to 5 of these symbols on the reels, the game goes into its free spins mode. Three golden wreath symbols will get you 15 free spins, four golden wreath symbols will get you 20 free spins and five golden wreath symbols will get you 25 free spins. These free spins come with a 3x wager multiplier. You can get anywhere between five to fifty times your wager based on the number of scatter symbols you get. The free spins play out on a background of the army fighting, which is enough to get your adrenaline surging as you wait to see what you can win. Victorious is great for high rollers, because of the high stakes in the game, and there are the wilds and free spins features to help you win even more cash. The excellent graphics and exciting background score are what give you even more to look for in the game. Definitely one game that will keep the adrenaline rushing, so you can enjoy the game for what it has to offer.